Members of the military and a Rhino at Fort Baxter Air Base. The Military in GTA games are the armed forces of the USA, comprising mostly of the Army, Navy, Air Force, Marine Corps and Coast Guard. The military themselves don't appear in Grand Theft Auto IV, because it enhances realism - the military would not be sent to kill one person, and because the Posse Comitatus Act prohibits the use of federal military personnel and units of the National Guard under federal authority from acting in a law enforcement capacity within the United States, except where expressly authorized by the Constitution or Congress. The army is replaced somewhat by NOOSE. The military is also important in many missions throughout the series, such as Sir, Yes Sir!, Black Project, Green Goo, Up, Up and Away!, Vertical Bird and Over the Top. As seen in the Grand Theft Auto Online gameplay trailer, the US Army is present in GTA V, identifiable by their UCP camouflage fatigues. The army in GTA 2. In Grand Theft Auto 2, the Army is responsible for eliminating any threat that is in the city and only appears from the six-star search. The soldiers are armed with machine guns and shots can kill the hero and destroy cars. The military uses different vehicles as the Barracks OL or Rhino. The military has its base in residential districts, but the base is totally inaccessible, but there are a small base in the Industrial District to which the mission can be accessed at Army Base Alert!. 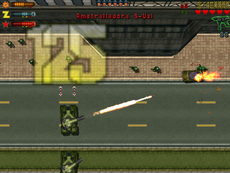 After the player gains six stars in a GTA III Era game, the army will begin to chase the player. On the ground, two military vehicles are used to kill the player; the Barracks OL, which is used for troop transport, and the Rhino tank. The soldiers themselves are always well armed with weapons that will often make short work of the player and most vehicles. 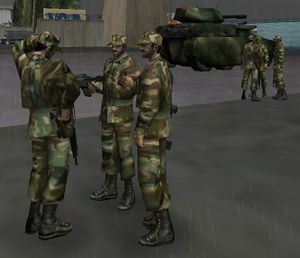 Members of the military behave as a gang in Vice City and will attack the player if spotted on military territory, unless in a Cop uniform. They will also set up roadblocks composed of the Barracks OL with soldiers armed with M16's in GTA III, M4's (in Fort Baxter Air Base) and MP5's (during a 6-star wanted level) in GTA Vice City, and M4 Carbines in every other GTA III Era game. These aren't as lethal as those of the FBI since there could be two FBI vehicles taking up one road with at least eight agents. But seeing as how the Barracks takes up the space of one road they can be broken through although their weapons will still pose an extreme threat. A strange thing is that soldiers in the Fort Baxter Air Base never participate in law enforcement activity; if the player is wearing a police uniform or army fatigues and enters the base with a wanted level; only the law enforcement officers that enter from outside will try killing the player. A solider in GTA III. Military soldiers in GTA Vice City. The army in GTA Advance. A soldier in GTA San Andreas. The Military only appearing at Fort Baxter in GTA Vice City Stories. After gaining six stars, the Rhino and occasional on-foot military soldier will appear. Soldiers are armed with AK-47's at all times. While encountering an occupied Rhino, the player cannot hijack the occupied Rhino. However, there are two ways the Rhino will react depending if the player is on foot or in a vehicle. If the player is in a vehicle, the Rhino will immediately fire at the player's vehicle setting it aflame (but not blow it up giving the chance for the player to bail out and save his or her life). However, if the player is on foot, the Rhino will reluctantly fire giving the player ample time to escape. The very slow speed of the Rhino makes it easy for the player to outrun it on foot. The Rhino will eventually fire at the player if the player stays in range on foot for too long. A direct hit usually kills the player unless the player has full health and full armor, but will reduce the health to roughly 25% and armor to 0%. The Military appears in Grand Theft Auto V, and are stationed at Fort Zancudo, a joint Army/Air Force base. They do not take part in the Wanted system unless the player enters the military base or its airspace. Fort Baxter Air Base in Vice City Mainland, Vice City. United States National Guard Depot in Ocean Docks, Los Santos, San Andreas. Easter Basin Naval Station in San Fierro, San Andreas. Area 69 in Bone County, San Andreas. K.A.C.C. Military Aviation Fuel Depot in Las Venturas, San Andreas. Fort Zancudo in North Chumash, San Andreas. Fort Baxter Air Base in GTA Vice City. The USS Numnutz in GTA San Andreas. The Easter Basin Naval Station in GTA San Andreas. Area 69 in GTA San Andreas. K.A.C.C. Military Fuels in GTA San Andreas. A Tank in GTA 1. An ICBM in GTA London, 1969. An Armed Land Roamer in GTA 2. A regular Land Roamer in GTA 2. A Pacifier in GTA 2. A Barracks OL in GTA Advance. A Tank in GTA Advance. A Rhino in GTA Chinatown Wars. A Rhino in GTA III. A Barracks OL in GTA III. A Patriot in GTA Vice City. A Barracks OL in GTA Vice City. A Hunter in GTA Vice City. A Cargobob in GTA San Andreas. A Hunter in GTA San Andreas. A Hydra in GTA San Andreas. A Launch in GTA San Andreas. A Patriot in GTA San Andreas. A Barracks in GTA San Andreas. A Military Mesa without a roof in GTA San Andreas. A Military Mesa with a roof in GTA San Andreas. The LHD-069 in GTA San Andreas. A Rhino in GTA San Andreas. A Patriot in GTA Vice City Stories. A Military Mesa in GTA Vice City Stories. A Hunter in GTA Vice City Stories. A Barracks OL in GTA Vice City Stories. In Grand Theft Auto: Vice City, the soldiers at the Fort Baxter Air Base are considered to be part of the Sharks gang. Furthermore, like with every other gang in GTA Vice City, the Fort Baxter soldiers will shoot at criminals in Vigilante missions. However, unlike other gangs, they can eliminate the criminals for the player. This is due to the soldiers always spawning in groups and carrying M4's, which can make short work of the criminal vehicles. In the GTA III Era the Rhino tank (which chases the player at six stars) does not fire its main gun. However, in Grand Theft Auto: Chinatown Wars the Rhino is programmed to use its turret to full effect, blasting the player into oblivion. The Vice City National Guard soldiers strangely seem to wear fatigues similar to the present day German Army fatigues.